Austria is a small but wealthy jurisdiction in the middle of Europe. As a member of the European Union, the Schengen Area and the Eurozone, it provides an attractive environment for wealthy people from Austria and abroad. According to a recent analysis by the Austrian Chamber of Commerce, more than 50 per cent of Austrian businesses are organised as family businesses under the EU definition. They account for almost two-thirds of all Austrian employees and 57 per cent of sales in Austria. Many of these families developed their Austrian local businesses into international players and continue to look for suitable solutions, not only for further evolving their business, but also for passing their wealth or enterprises on to the next generation. High net worth individuals from abroad are mainly attracted by Austria's natural beauty and cultural richness. In the Mercer Quality of Living Ranking, Austria's capital city, Vienna, has been ranked number one for nine consecutive years and its political stability and security appeal to people from abroad. In addition, Austria has introduced a citizenship and residency by investment scheme, which further entices non-Austrians looking to relocate. The challenge of the rather high personal income tax rates requires structuring and planning on the part of advisers. Austrian structures often include an Austrian private foundation, which in particular caters to the individual's wish for predictability and stability in relation to asset management and succession. Any individual having a permanent home or his or her habitual abode in Austria is deemed to be an Austrian tax resident.2 There is no concept of domicile in Austria. Individuals have their habitual abode or habitual residence in Austria, if they stay in Austria not only temporarily (e.g., holiday, business trip, family visit) but for a longer period of time. In any case, after a six-month stay, they become retroactively resident for Austrian income tax purposes. other specified income, such as certain annuities and capital gains upon the disposal of certain privately held assets, in particular real property. Income not covered by these categories is not taxable. Austria has entered into about 90 income tax and capital gains tax treaties, including treaties with the UK and the US. They generally follow the Organisation for Economic Co-operation and Development (OECD) model, except for some of the older agreements, such as the ones with Brazil, France or Japan, which substantially deviate from the OECD model. Before Austria abolished its gift and inheritance taxes in 2008, it entered into very few inheritance and gift double taxation treaties, which generally follow the OECD Model Estate and Gift Tax Treaty, among them an agreement with the US. Pre-entry income and capital gains tax planning is generally not required. Financial assets held by a newly established Austrian tax resident receive a step-up in basis to the fair market value at the time such individual becomes tax resident in Austria.11 Any Austrian capital gains tax payable in the event of a disposal will be based on the step-up basis.12 It is, therefore, advisable to keep a record of the assets' fair market value at the time of entry into Austrian tax residence. An Austrian branch of a foreign corporation is subject to Austrian corporate income tax if it qualifies as a permanent establishment. If the individual held its business interest in Austria via a foreign corporation, that foreign corporation would thus become subject to Austrian corporate income tax with all income attributable to the permanent establishment in Austria. Implementing the Fourth EU Anti-Money Laundering Directive, Austria also established a Register of Beneficial Owners. Austrian legal entities, including private foundations, are obliged to disclose and submit the details of their (ultimate) beneficial owners to this register and keep it updated at any time.26 The Austrian Register of Beneficial Owners is not of public record. Apart from the (tax) authorities, it is accessible by duly authorised legal, financial and tax advisers as well as the concerned entity itself. Under Austrian law, the principle of testamentary freedom applies and an individual is generally not restricted in his or her disposition over his or her estate during their lifetime. An individual's estate for succession thereby comprises all of his or her rights and obligations at the time of his or her death, whether in his or her sole name or in a co-ownership. Austrian law bestows the same statutory inheritance rights on illegitimate and adoptive children to their adoptive parents' estates as on natural legitimate children.41 In addition, adoptive children keep their statutory inheritance rights to the estates of their natural parents.42 Adoptive children, however, have no statutory inheritance rights to the estate of other members of their adoptive family. Under Austrian law, all heirs generally administer the estate jointly.49 It is possible to appoint a special administrator or executor for the estate, usually either based on the testator's will or a respective joint application of the heirs. Austria implemented the EU Succession Regulation, under which the distribution of a person's estate is generally governed by the law of the country, where the deceased had his or her last habitual abode, regardless of whether it is an EU country or not.52 An individual may also validly opt for the application of the inheritance regime of his or her nationality in his or her last will.53 The respectively applicable law governs the distribution of movable and immovable property. so far as immovables are concerned, the place where they are situated. There are no trusts under Austrian law. Austria has neither ratified the HCCH Convention or the Law Applicable to Trusts and on their Recognition (the Hague Trust Convention). In relation to their income, Austrian private foundations are treated like corporations under the Austrian Corporate Income Tax Act and, therefore, subject to the common corporate income tax rate of 25 per cent on their worldwide income; dividends received by a private foundation are, however, usually tax-exempt.64 A withholding tax of 27.5 per cent is generally levied on distributions to beneficiaries,65 but double tax treaties typically grant relief if the beneficiary is a non-Austrian tax resident. 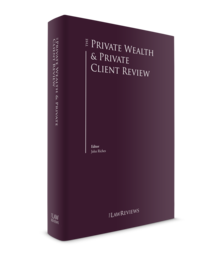 Austrian private foundations are primarily established for purposes of succession planning, in particular if the founder's assets shall not be broken up between his or her heirs. This is especially of interest to a founder who is the owner of an active enterprise, which, in future, could be controlled by the private foundation as a common representative of the next generation. As the beneficiaries of the private foundation, the heirs would commonly form an advisory board that may guide the management board in its executive decisions. In addition and on a more general note, a private foundation's beneficiaries are not on public record69 and the private foundation's financial statements remain undisclosed to the public. The private foundation, therefore, grants the most possible privacy to the founder and the beneficiaries while still being a viable asset-pooling and -holding vehicle. These aspects will be further supplemented by the possibility of a sleeker management board as proposed by the 2017 Private Foundation Bill. Austria is a wealthy and politically stable jurisdiction that will continue to appeal to people of sizeable wealth. In the near future, it will implement the next steps proposed by the EU under the Anti-Tax Avoidance Directive and Base Erosion and Profit Shifting, and will introduce a CFC provision to the Austrian Corporate Income Tax Act applicable for financial years starting on or after 1 October 2018. This measure will also affect corporate holding structures held by private foundations and high net worth individuals, and, therefore, lead to a re-evaluation of current arrangements. The upcoming months will also show how and when the recently elected conservative government will follow through with their announcement to introduce a more business-friendly tax regime, which should also attract inward investment more strongly. 1 Paul Doralt is a partner and Katharina Binder is an associate at DORDA. 2 Section 1(2) of the Austrian Income Tax Act. 3 Section 26(1) of the Austrian Federal Fiscal Procedures Act. 4 Austrian Secondary Residence Regulation. 5 Unlimited tax liability, Section 1(2) of the Austrian Income Tax Act. 6 Limited tax liability, Section 1(3) of the Austrian Income Tax Act. 7 Section 2(3) of the Austrian Income Tax Act. 8 Section 33(1) of the Austrian Income Tax Act. 9 Section 27a of the Austrian Income Tax Act. 10 Section 30a(1) of the Austrian Income Tax Act. 11 Section 27(6)1e) of the Austrian Income Tax Act. 12 Section 27a(3)b) of the Austrian Income Tax Act. 13 Section 103 of the Austrian Income Tax Act. 14 Section 27a(3)b) of the Austrian Income Tax Act. 15 Section 27(6)1a) of the Austrian Income Tax Act. 16 Section (6)(6) of the Austrian Income Tax Act. 17 Austrian Gift Notification Act. 18 Sections 1 and 4 of the Austrian Real Estate Transfer Tax Act. 19 Section 4(1) of the Austrian Real Estate Transfer Tax Act. 20 Section 7(1)(2)a) of the Austrian Real Estate Transfer Tax Act. 21 Fee Item 9(b) of the Austrian Court Fees Act. 22 Section 12 of the Austrian Property Tax Act. 23 Sections 19ff of the Austrian Property Tax Act. 24 Section 1 of the Austrian Corporate Income Tax Act. 25 Section 22 of the Austrian Corporate Income Tax Act. 27 Section 22 of the Austrian Federal Fiscal Procedures Act. 28 Section 22 of the Austrian Federal Fiscal Procedures Act as will be implemented under the Austrian Annual Tax Act 2018. 29 Sections 10 and 11 of the Austrian Corporate Income Tax Act and Section 94 of the Austrian Income Tax Act. 30 Section 1253 of the Austrian General Civil Law Code. 31 Sections 757 and 759 of the Austrian General Civil Law Code. 32 Section 763 of the Austrian General Civil Law Code. 33 Sections 778 and 779 of the Austrian General Civil Law Code. 34 Section 765(2) of the Austrian General Civil Law Code. 35 Sections 780ff of the Austrian General Civil Law Code. 36 Sections 727ff of the Austrian General Civil Law Code. 37 Section 744(1) of the Austrian General Civil Law Code. 38 Section 744(1) of the Austrian General Civil Law Code. 39 Section 744(1) of the Austrian General Civil Law Code. 40 Section 748(1) of the Austrian General Civil Law Code. 41 Section 197 of the Austrian General Civil Law Code. 42 Section 199 of the Austrian General Civil Law Code. 43 Section 577 of the Austrian General Civil Law Code. 44 Section 578 of the Austrian General Civil Law Code. 45 Section 579(1) of the Austrian General Civil Law Code. 46 Section 579(2) of the Austrian General Civil Law Code. 47 Section ۵۸۴ of the Austrian General Civil Law Code. 48 Section 569 of the Austrian General Civil Law Code. 49 Section 810(1) of the Austrian General Civil Law Code. 50 Sections 800 and 801 of the Austrian General Civil Law Code. 51 Sections 800 and 802 of the Austrian General Civil Law Code. 52 Article 21 of the EU Succession Regulation. 53 Article 22(1) of the EU Succession Regulation. 54 Article 1 of the Hague Testamentary Dispositions Convention. 55 Section 1(2)(1) of the Austrian Private Foundation Act. 56 Section 4 of the Austrian Private Foundation Act. 57 Section 15(1) of the Austrian Private Foundation Act. 58 Section 15(2), (3) and (3a) of the Austrian Private Foundation Act. 59 Section 20 of the Austrian Private Foundation Act. 60 The current status of the bill can be monitored at https://www.parlament.gv.at/PAKT/VHG/XXV/ME/ME_00323/index.shtml#tab-Uebersicht. 61 Section 2 in connection with Section 1(5) of the Austrian Foundation Entry Tax Act. 62 Section 2 of the Austrian Foundation Contribution Tax Act. 63 Section 7(2) of the Real Estate Transfer Tax Act and Fee Item 9(b) of the Austrian Court Fees Act. 64 Sections. 1, 10 and 22 of the Austrian Corporate Income Tax Act. 65 Section 27(5)(7) of the Austrian Income Tax Act. 66 Section 13 of the Austrian Corporate Income Tax Act. 67 Section 13(4)(4) of the Austrian Corporate Income Tax Act. 68 Austrian Supreme Administrative Court, 20 September 1988, 87/14/167; EAS 2378, EAS 2804. 69 An Austrian private foundation's beneficiaries must only be disclosed to the tax authorities and in the non-public Austrian Register of Beneficial Owners (Section 2(3) of the Austrian Beneficial Ownership Register Act).